Plenty of followers swear by meditation to cure a long list of ails. But how does it work? Neuroscientist Clifford Saron, of the University of California, Davis, and a Who’s Who of peers, are spending millions to find out. IN THE SPRING OF 1985 THINGS STARTED TO GO WRONG. A jittery teenager held a pistol to my wife’s head and robbed us a few blocks from our home in Houston. A few months later, I had too much to drink at a party and felt as though I was asphyxiating. At the emergency room, they decided I was just hyperventilating but the next morning I woke up feeling disoriented, with tingling extremities. Our doctor thought I had mononucleosis, so I spent the next three weeks resting, obsessing about what was wrong. Before long, I was taking antidepressants and seeing a therapist. We spent months unraveling the skein of childhood dysfunction I had long taken for granted. Divorced parents? Check. Domestic violence? Check. Catholic upbringing? Check. Therapy gave me a deeper understanding of what made me tick, but brought little relief. I still spent most of my waking hours registering every wayward thought and physical sensation. One day I came across a copy of Minding the Body, Mending the Mind, by Joan Borysenko. A biologist and psychologist, Borysenko had collaborated at Harvard with Herbert Benson, who in the late 1960s began investigating how mental states can affect physical well-being. Her book, published in 1987, perfectly described the intense anxiety I’d been experiencing. The author suggested something novel: sit down, relax the belly, and follow the breath as it comes and goes; when a thought arises, let it go and return to following the breath. Figuring I had nothing to lose, I gave it a try. And for the first time in two and a half years I found some respite, some intervals of feeling whole and relaxed. Curious about the roots of meditative practice, I started reading about Buddha’s quest to diagnose the cause of human suffering, and came across the idea that we suffer because we are attached—we always want things to be other than the way they are. Soon I was pulling out a cushion every morning and evening to meditate for 30 minutes. I certainly felt better, yet I couldn’t help wondering why meditation “worked.” How might modern science explain the benefits of a mind-focusing technique taught 2,400 years ago by an Indian spiritual teacher? It turned out that a lot of scientists wondered the same thing. 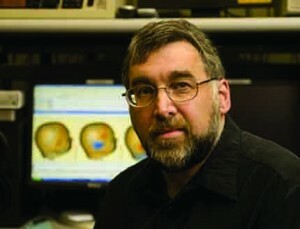 Neuroscientist Clifford Saron of the University of California, Davis. ONE OF THE MOST AMBITIOUS STUDIES of the psychological, physical, and behavioral effects of meditation ever undertaken is The Shamatha Project, a multi-million dollar effort led by neuroscientist Clifford Saron of the University of California, Davis. Although only a fraction of the data has been published so far, the experiment offers powerful evidence that a regular meditation practice can sharpen our perception, promote a greater sense of well-being, and encourage a more empathic response to others. And, through alleviating stress, meditation may even play a role in countering the effects of aging. As a Harvard undergraduate in the early 1970s, Saron befriended future meditation researchers Richard Davidson and psychologist Daniel Goleman, and took up the practice himself. “I was very influenced, even before college, by the possibilities of investigating the mind from the inside,” he says. Saron helped start the Center for Mind and Brain at UC Davis in 2002. The next year, he got a call from B. Allan Wallace, a former Tibetan Buddhist monk and founder of the Santa Barbara Institute for Consciousness Studies, who proposed that they measure the effects of meditation on people in an intensive retreat setting. Saron eventually received a sizable grant from the Fetzer Institute, along with other funding, and assembled a large research team that included Wallace as the meditation instructor and Erika Rosenberg, a research psychologist at UC Davis and longtime meditation teacher. Coinvestigators included a veritable Who’s Who of meditation researchers, including Richard Davidson, who had been studying brain activity of Tibetan Buddhist monks in his laboratory at the University of Wisconsin-Madison; and Elissa Epel, a research psychologist at the University of California, San Francisco, and her colleague, molecular biologist Elizabeth Blackburn. In 2009, Blackburn shared the Nobel Prize in medicine for showing how telomeres, the bits of DNA that cap the ends of chromosomes like the tips of a shoelace, help protect chromosomes as cells divide. With repeated cell division the telomeres get shorter, until the cell dies or lapses into a form of suspended animation called senescence. Thus, telomere length is a measure of cellular aging. Epel and Blackburn have shown that stressed-out people, such as Alzheimer’s patient caregivers, tend to have shorter telomeres and are in effect aging prematurely. Saron says that the project asked: “What do people do differently because they have meditated?” There were also more specific questions. Can attention be trained through contemplative practice? Are improvements in attention related to psychological function? What are the behavioral, neural, and physiological correlates of such training? The study monitored the brains, bodies, and behavior of 60 people recruited through ads in Buddhist magazines. The subjects had to have had prior meditation experience, including at least one previous retreat with Wallace, and be willing to spend three months at a meditation center in Red Feather Lakes, Colorado. They were randomly divided into two matched groups of 30, the second group serving as a control group that would later go on a retreat of their own. The first group underwent tests during their retreat that were also administered to the control group; later, the control group was tested during their retreat. Saron’s research team built two side-by-side psychophysiology labs at the retreat center. They also built a blood lab used for, among other things, spinning serum samples in a cooled centrifuge for later measurement of telomerase, an enzyme believed to preserve or even rebuild telomeres—and perhaps protect cells from aging. Next door, in the psych lab, retreat participants performed exacting computer-based perceptual and attention-gauging tasks. At times, they wore caps studded with 88 electrodes hooked up to an electroencephalograph that recorded their brain waves as they watched disturbing movies. A video camera meanwhile surreptitiously captured their facial expressions, allowing researchers to rate their emotional reactions using the Facial Action Coding System developed by psychologist Paul Ekman, Rosenberg’s mentor. “Every visually distinguishable movement the face can make has a numeric code—there are 44 of them,” explains Rosenberg, who was a consultant for Lie to Me, a TV show based on Ekman’s work. The first group began its retreat in February 2007. Wallace instructed subjects in the practice of shamatha (“calm abiding”), a series of methods for enhancing one’s attention, such as mindfulness of breathing. He also taught them to cultivate what Buddhists call the Four Immeasurables—loving-kindness, compassion, empathetic joy, and equanimity. Each person meditated alone an average of seven hours a day, and also met twice daily for guided meditation with the rest of the group and had weekly interviews with Wallace. Testing was done before, during, and after the retreat. Members of the control group, who were going about their daily lives at home, were periodically flown in for screening as well. Heart rate, blood pressure, and muscle activity, among other things, were recorded during tasks. There were also 15 computer-based measurements of attention and emotional response, questionnaires on mood and experience, a daily meditation log, and extensive interviews conducted at all stages of the process. Blood samples were tested for telomerase, hormones such as oxytocin, vasopressin, and cortisol, and for several types of molecules called cytokines. When we’re stressed, cytokines trigger inflammation throughout the body, which can cause serious problems if unchecked. In a brain-and-body feedback loop, if the central nervous system detects the presence of cytokines, it releases the neurotransmitter acetylcholine, which tells cells in the spleen and other organs to dial back the immune response. Rosenberg says, meanwhile, that participants were more moved by certain film scenes of suffering they were shown, and less likely to recoil from them than members of the control group. As the retreat progressed, she says, the meditators also showed greater fluidity in their emotional responses. The perceptual changes, response inhibition, and overall psychological adaptive functioning results were replicated when the members of the control group went through their own retreat. Remarkably, many of the improvements seen in both groups persisted for months after the retreats ended. Social psychologists have found, for example, that most people are happier and less anxious from their mid-50s onward. The participants in this study were in their late 40s on average, so maybe they were better adjusted and more inclined to respond to meditation than the larger population to begin with. On the other hand, the control group didn’t show the same responses until they went on retreat. With a trove of data still awaiting analysis, Shamatha Project researchers expect to continue publishing papers for several more years. Meanwhile, other scientists continue their efforts to replicate and better understand the project’s findings. SCIENTISTS AGREE THAT MUCH OF THE ILLNESS plaguing people in the developed world—conditions like heart disease, cancer, hypertension, diabetes, and many autoimmune disorders—is exacerbated by chronic stress. When we perceive threats, the body’s “fight or flight” system is activated, releasing bursts of cortisol and adrenaline that speed up the heart and breathing, constrict blood vessels and trigger a cascade of other reactions. If this stress response stays stuck in the “on” position, this can lead to heightened inflammation and potentially damage tissues throughout the body. One clue to how meditation reduces stress came in 1971, when Harvard’s Herbert Benson took physiological measurements of people engaged in Transcendental Meditation, loosely based on a Hindu practice of mantra repetition. He reported striking stress-reducing changes, such as lowered heart rate and a slower rate of oxygen consumption, which he dubbed the “relaxation response.” Another clue came in the late 1970s, when Jon Kabat-Zinn, a molecular biologist at the University of Massachusetts Medical School, wondered whether meditation might help patients with stress-related problems. Drawing on his knowledge of, among other things, yoga, as well as his training in Korean Zen meditation, Kabat-Zinn created an eight-week program he called Mindfulness-Based Stress Reduction. In 1982, he reported that chronic pain sufferers saw a 50 percent reduction in their self-rated symptoms after undergoing a course in MBSR. Kabat-Zinn hypothesized that as people learn to see their thoughts and symptoms as separate from themselves, there is an “uncoupling” of the pain stimulus from their emotional responses. These effects proved to be durable in the course of a four-year follow-up. MBSR has since been shown in numerous studies to substantially benefit people suffering from conditions as diverse as psoriasis, fibromyalgia, cancer, heart disease, depression, anxiety, and obesity. Mind-body research gathered momentum in the 1990s, when positron-emission tomography and magnetic resonance imaging (MRI) scanning made it possible to look inside a meditator’s brain. In a 2003 study, Richard Davidson and Kabat-Zinn reported that immune function improved in people who had just completed an eight-week MBSR course, as measured by their antibody response to a flu shot. The researchers also noted increased brain-wave activity in the left forebrain—a pattern, they pointed out, that had previously had been associated with better immune response. Then, in 2005, Harvard neuroscientist Sara Lazar found physical differences in the brains of experienced meditators. MRI scans showed they had a thicker layer of tissue in the prefrontal cortex, a region thought to help integrate emotional and cognitive processes. The differences were most pronounced in older subjects, suggesting that regular meditation practice might even offset the cortical thinning that normally comes with age. In 2010, Lazar and her colleague Britta Hölzel reported greater neural gray matter density in before-and-after testing of the brains of people who had undergone MBSR training, possibly as the result of the creation of new neurons. As Saron points out, meditation remains notoriously hard to define or standardize. Subjects may use different techniques: “Somebody could be contemplating compassion and the other immeasurables, and somebody else could be focusing on the breath.” And somebody else could be just daydreaming. THE EXPERIENCES REPORTED by Saron’s subjects feel familiar. In 1988, my wife and I moved back to New Mexico, and within a year I had joined a Zen center. My fellow practitioners all wrestled with their unruly minds and emotions, I soon learned. Attending intense seven-day Zen retreats called sesshin, I was frustrated to find that even after practicing for some years my head was still often swimming with anxious thoughts—what meditation teachers call “monkey mind.” All those hours spent on the cushion are probably necessary, though. Only after you realize the same thought has popped into your head for the ten-thousandth time do you finally lose interest in it. Now, there’s a lot less mind wandering and anxiety, and that claustrophobic feeling of being trapped inside my head amid a thicket of panicky thoughts has largely faded. The emerging scientific explanation for all this is surely gratifying. And yet it no longer matters as much. In the end, the experience validates itself. Michael Haederle lives in New Mexico. He has written for the Los Angeles Times, People Magazine, Tricycle: The Buddhist Review and many other publications. He has also taught at Syracuse University’s S.I. Newhouse School of Public Communications and is a Zen lay monk.